We start the day with a half day tour of Bangkok, visiting the stunning Grand Palace complex and the Royal Temple of the Emerald Buddha. The Afternoon is spent cruising along the many canals of Bangkok's rural suburbs. You'll stop along the way to visit places of interest including markets, gardens and the Royal Barge House. Today you board our rice barge and start sailing up the Chao Phraya River. In the morning you'll stop to explore the Mon pottery village on the island of Ko Kred and visit Pathum Thani market where various vegetables, meats and other local produce are sold. 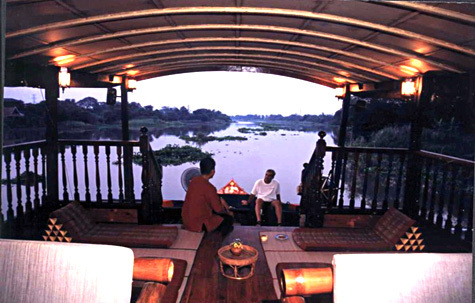 In the afternoon you'll continue along the Chao Phraya River before branch off onto one of its tributaries. Early this morning you'll have a chance to give alms to the local monks and learn more about their religion. After breakfast you'll take a cycling tours to explore the local villages and temple. After lunch we continue your cycle tour visiting a local orphanage and various local cottage industries. Your morning visits today will include the lively market at Pamok and a tour of the local school. You'll also spend some time meeting a local family that make drums, before we head on to Ayutthaya. From here we board a modern boat for the fast transfer back to Bangkok. This morning we take a boat ride along Damnoen Saduak canal enjoying the sights and sounds of local Thai life. The morning ends with a visit to the famous floating market where local traders sell their produce from boats on the canal. Your afternoon is free to relax or include some other optional tours.